Alessandra Calò was born in Taranto in 1977. She lives and works in Reggio Emilia. 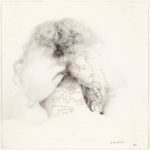 Artist and photographer, from the beginning she has experimented with the use of new languages ​​that allow her to deepen the themes linked to memory, identity and the language of photography as such. Her passion for art and the visual world has developed independently with an eye always focused on photography. 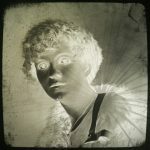 Over the years she has specialized in antique photographic printing techniques and in the creation of real installations. The appropriation and recovery are dominant in her work and are realized through double exposures and superimpositions of materials which allow her to delve into the history of intimate stories but with a universal implications. She e has participated in exhibitions and festivals in Italy and abroad including the Festival Circulations Paris, Fotografia Europea Reggio Emilia, Open House Rome. Over the years she has published several photographic books and some of her works are found in interior design or industry magazines.